Meet 2012 Page Turner Champion Leola Ogle! 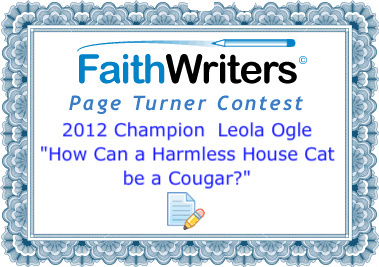 I’m so excited to introduce you all to Leola Ogle, the 2012 winner of the FaithWriters Page Turner Writing Contest. Read on to find out more about her, the book she won with, and her passions. LEOLA: I was very young, maybe nine or ten. I started writing novels, but would only complete 20 or 30 pages, all hand written back then. I’ve always been an avid reader, which has contributed to my desire to write. Life happened: I married very young, had five babies by the age of twenty-five. My house has always been filled with journals and writing projects, but it wasn’t until I retired in 2011 that I devoted time to my passion to write. I guess we’re never too old to pursue our dream. JOANNE: God can always use us, can’t he? Is writing a hobby or potential career for you? LEOLA: Both. I’m hoping to turn it into a career. JOANNE: With your talent and God’s blessings, I’m sure you will succeed. Share a bit about How Can A Harmless House Cat Be A Cougar? Where did you get the idea for it? What’s it about? How far along in it are you? My entry is my story. Yes, I am that House Cat! Jeff and I met in a singles’ group at our church in 1989, and he asked me out in January 1990. Both of us had come out of painful divorces. I had been seeking God for a husband, and thought Jeff’s interest in me was God’s sense of humor. I was a forty-two-year-old grandmother with five grown children. He was twenty-six, and had three small children. We dated off and on for four years, and finally got married in 1994. The first time someone called me a cougar, I didn’t know what it meant. Though it’s a hot topic currently, I don’t consider myself a cougar. How Can A Harmless House Cat Be A Cougar? deals with our families’ and friends’ reactions, our apprehensions about marriage, but most importantly, it deals with the challenges that many blended families face. Those challenges have almost nothing to do with our age difference. It’s a love story, a story of hope for the brokenhearted, and a story of God’s faithfulness. Love and respect, together with a strong faith in God, are the keys to any successful relationship or marriage. In October, we celebrated our eighteenth anniversary. We are still very much in love, and are best friends. It was my husband’s idea for the book. When the whole Cougar phenomena became trendy, he kept insisting I write our story about the “older woman/younger man” from a Christian perspective. The media and reality television put a different spin on it than what we’ve experienced. It’s two-thirds finished, but I’m already energized to get it completed. JOANNE: Wow – sounds like a great story – one that families of all types could benefit from. You’ve been entering the Writing Challenge for a couple years now, and fairly regularly. What do you like most about it? LEOLA: I love everything about the Writing Challenge. It has been the most instrumental learning tool in my writing. I appreciate the praise, but have thrived and grown from the red ink. I study winners’ entries, and glean from that. I love the mental challenge of creating a short story from a topic. I feel like I’ve come to know some of the regulars on FaithWriters – a very sweet, supportive, and friendly group. JOANNE: I could say the same thing – and I should REALLY get back to the challenge again. Anyhow, how did you find FaithWriters and what made you stick around? 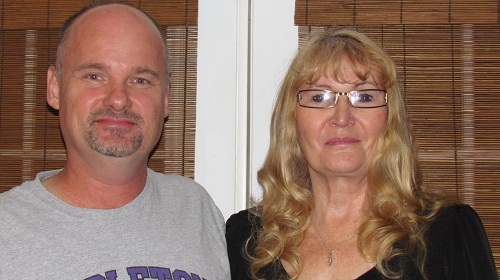 My friend, Jan Christiansen, is the one who encouraged me to pursue my passion to write by talking me into entering the 2010 NaNoWriMo (National Novel Writing Month). I was still employed, and told her I didn’t have time. I surprised myself by exceeding the 50,000 word requirement, and couldn’t stop writing after that. Jan also told me about FaithWriters and suggested I join. She said it would help develop my writing skills, and it has. I’ve joined a couple of other Christian Writers’ groups since then, but FW is still my favorite. I’ve recommended it to several friends who have also joined. JOANNE: What kinds of books or genres to you prefer to read and/or write? LEOLA: I love what is considered edgy Christian fiction. It is also my preference for writing. My favorite Christian authors are Francine Rivers and Karen Kingsbury. I have been involved in ministry all my adult life, and also worked for Teen Challenge for nineteen years. I love ministry. In working with people, I’ve seen the best and worst in Christianity. One common thread remains a steadfast truth: God is faithful, God restores, and God is all about people. In the Bible, God revealed the best and worst in humanity. We live in an imperfect, fallen world, but God still reigns over it all. I’ve seen good people fall. I’ve seen grand sacrifices, and noble deeds done with true humility. I want to write about those things, and hopefully show God’s heart in the midst of it all, the good and the bad. JOANNE: I love your passion for ministry. Tell us about your family. We are a blended family. I have four daughters, and one son. My husband has two sons and one daughter. We have over twenty grandchildren, seven great-grandchildren and the count keeps growing. My husband is my greatest supporter and cheerleader when it comes to my writing. We are both involved in church. He is a credentialed minister. Several of our children are involved in ministerial and church leadership. We attend church where my daughter and her husband are the pastors, and my grandson is the worship leader. In 2006, Channel 3 News did a Thanksgiving segment on my family because we have five generations born in Phoenix, Arizona. We were described as a motley, eclectic group that includes church pastors, and those with tattoos and piercings, but bonded together by love. That sums it up. We’ve seen our share of struggles and heart break within our family, but our love and faith pulls us through. JOANNE: Sounds like a wonderful family to be a part of! What are your other passions besides writing? Three words: God, people, and family. I am passionate about my relationship with God. Words can’t describe the depth of my love and gratitude to Jesus Christ. Sometimes I am dropped to my knees in awe of His faithfulness to me and my family. I am passionate about people. In our world, it’s easy to become jaded and cynical. I pray continually to guard my heart against it, because I can slip into that mindset and not realize it. If we could only see people through the eyes of mercy and compassion of God, how differently we would treat others. I feel passionate about family; my family, of course, but the family unit in our world today. The very foundation of family structure is under attack, and it concerns me. JOANNE: Do you make New Year’s Resolutions? If so, what do you hope to accomplish in 2013? One of my desires, goals for 2013 is to have one of my novels/books published. I did have a novel Like A Cedar In Lebanon self-published in November of this year, but I’m hoping to get a traditional publisher to pick up one of my books in 2013. I also want to improve my skills in the craft of writing. It seems rules frequently change and evolve. JOANNE: There’s always something to learn, isn’t there? Congratulations on your win, Leola, and it was wonderful to get to know you better. Best of wishes to you in all your endeavors! Watch this spot in the coming weeks for interviews with the two Page Turner runners up: Beth Meuhlhausen and Dannie Hawley. Meet Nonfiction Page Turner Champ Nicki Jeffery! Meet 2015 Page Turner Champion Debbie Roome! 2012 Non-Fiction Page Turner Winners! What a great interview! You’ve captured the Leola’s personality perfectly. She really is that sweet, loving, edgy Christian with a crazy, fun family. While it’s true I encouraged Leola to write, the God-given talent was in her all along. Once she started, words poured out of her life experiences and filled up the pages of several manuscripts to date. I have no doubt that she will see her 2013 dream of traditional publication come to pass. Congratulations, Leola! Well, I am proud to say that I am Leola’s oldest child. I am so very proud of her. The way she answered the questions in this interview is truly how she is. Everyone she comes into contact with, is truly touched by her. We really are a very blessed family. I have known about her passion for writing since I was very young. I am so glad she is finally doing what she has wanted to do for so long. I also have no doubt she will get her book(s) published. We’ve always known what a GREAT woman of God she is. Now the rest of the world will get to see and know what a special person she really is.